Do you wish to restore the good look of your window surfaces rapidly and efficiently?Are you searching for an approach of effective window washing? If the answer is positive, you have come to the right company! With the specialists of window cleaning in Walthamstow, you will positively bring back the light into your home. You will enjoy spotless glass surfaces as well as superbly clean framework and sills. You will be able to use your recently-acquired leisure time as you desire while we clean the windows of your home. You will not only avoid this tedious and troublesome work – our services will additionally present you some attractive advantages. We also provide our professional services in nearby areas: Waltham Forest, Upper Edmonton, Bounds Green, Woodford, Ponders End. We use exceptional techniques of window cleaning to ensure you will have excellent end results. With the water fed pole system, high pressure cleaning and rope access team, you can be sure that your property's glass surfaces will be sparkling. In addition, your house is in good hands – the cleaners are completely insured and comprehensively trained. The water fed poles are linked to water supply tanks, while our rope access pledges for safety – even when we clean skyscraper-sized buildings. You can get advantage from these options now – dial 020 3746 3113! You can rest assured that the gleaming look of your office building is guaranteed. The specialists will provide you with top-notch commercial window cleaning. With the help of our water-fed extension pole tools, you will receive quick and excellent washing of all windows as high as the fourth floor. For high-rise buildings, we employ our rope access gears. It is our next-generation way of reaching glass panes on taller edifices. No matter what is the size of your property – a humble corner shop or the Shard – we will leave a great look of your windows. The technicians have the experience and the essential equipment to provide you with both residential and business window cleaning. You can depend on us for all types of glass surface cleaning. 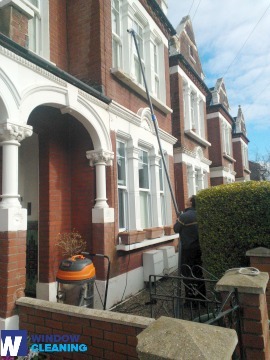 For example, we can clean small or double windows, French doors, sash windows, bay windows and patio doors. Furthermore, if you have garden glass surfaces, conservatory or roof windows, we can clean them as well. We use the most advanced methods and the latest equipment for all the aforementioned window types. Profit from our residential window cleaning in Walthamstow – we provide five-star services for your home on attractive prices. We use purified water to clean the windows completely. We clean from the ground with water-fed pole system. Find us now - ring 020 3746 3113 or just use our booking form. Our operators will help you book and answer your questions. You will appreciate the results of our household services, we guarantee that! The nearest tube station serving E17 Walthamstow is Blackhorse Road.